Montezuma Valley was home to upwards of 30,000 people at it's peak in the mid-1200s. Photo by Chaz Evans. The fertile Montezuma Valley below Mesa Verde may have been home to 30,000 residents at it’s peak in the mid-1200’s, who lived in large valley pueblos, including Yellowjacket, a Conservancy preserve. Yellowjacket is the largest pueblo built by the Mesa Verde Anasazi and contains the highest density of ceremonial structures ever found in the Southwest, including 182 kivas, a great kiva, 17 towers and a great tower. 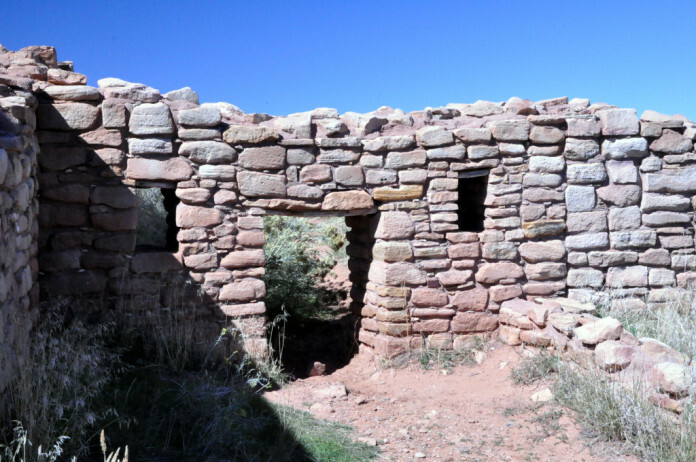 Construction of Yellowjacket began by at least A.D. 950, and the masonry pueblo was likely occupied continuously until A.D. 1300, when the entire region was abandoned. Certain room blocks at the site were three stories high. According to David Breternitz, professor emeritus at the University of Colorado, Yellowjacket is ” key to understanding the final Anasazi occupation of the area and how it relates to other sites of the period. Between 1981 and 1984, the Conservancy launched a program to preserve the Yellowjacket Pueblo, acquiring from three tracts of land from separate land owners that contained 70 percent of all features and structures. In 1997 the Conservancy received a grant from the Colorado Historical Society’s State Historical Fund, matched by donations from private donors and members, to purchase another 45 acres of the site. In addition to Yellowjacket, the conservancy also has three smaller Mesa Verde pueblo preserves in the Valley, including Mud Springs Pueblo, which covers 50 acres itself.